When you think of Kat Von D, you probably think: tattoos, star of the reality show LA Ink , badass winged eyeliner game. It's less likely you think "vegan activist" — but that's exactly what Von D also is. 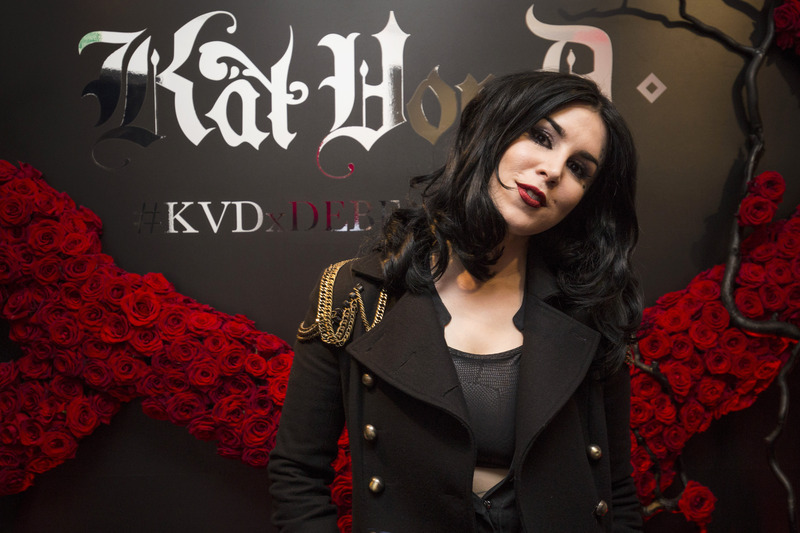 Not only did she recently take her makeup line Kat Von D Beauty completely cruelty-free with a commitment to go fully vegan, but she's also become an outspoken advocate for animals. So much so, in fact, that she was honored last Saturday with the Compassion In Action Award at Farm Sanctuary's 30th Anniversary Gala in Los Angeles. "Honestly, I lose a lot of sleep over this," she told the Farm Sanctuary Gala audience upon accepting her award. "To know I get to enjoy all my luxurious freedom, when at this very second, millions of animals are getting brutally abused and slaughtered. In the U.S. alone, 300 chickens are slaughtered per second — which means [in the past two minutes] 36,000 chickens were debeaked, boiled alive, and had their throats slit." "Some days I feel super hopeless, especially when I experience constant resistance to the truth on social media," Von D continued, visibly emotional. "But just because at times, things feel hopeless, and just because saying something or doing something about it feels uncomfortable, that uncomfortableness is not a good enough excuse to not fight for these animals." She then pledged to keep fighting and being a voice for voiceless animals everywhere — despite the backlash from some fans she's received on social media who don't agree with her veganism. While she's always been an animal-lover, like most of us, Von D didn't always eat vegan — the change actually happened as a result of becoming sober, almost 10 years ago. "It was a first step to living a more conscious life," she tells Bustle. "So although my sobriety and making the shift to becoming vegan aren't directly connected, I do believe seeing the world through sober eyes made it easier to continue making improvements in my life. But you don't have to be sober to be vegan of course! I know plenty of vegans who party hard!" "Yes, it did cost money to make the change — but is it worth paying money to eliminate animal exploitation? Absolutely." After becoming vegan five years ago and "coming out" as vegan in 2015, Von D realized it would be hypocritical to sell makeup that was anything but — and so she decided to make her already-successful makeup line, Kat Von D Beauty, completely cruelty-free — and eventually, completely vegan. The hardest part about it, she says, wasn't changing the formulations — but simply having patience during the transition. "We live in a time where technology really makes it easy to use substitutes to any and all animal-based ingredients — it's just a matter of making the effort, and then waiting for those existing formulations to sell through," she tells Bustle. "And yes, it did cost money to make the change — but is it worth paying money to eliminate animal exploitation? Absolutely." Now, Kat Von D Beauty is completely cruelty-free — meaning there is no animal testing or animal products or by-products in her makeup line, which is a top-seller at Sephora. You can find out which products have already transitioned to being fully vegan here. If you're also considering going vegan but are struggling to make the transition, Von D recommends you watch the documentaries Forks Over Knives (which explains the health benefits of a plant-based diet), Cowspiracy (which details the environmental impact of animal agriculture), and Earthlings (often called "the vegan-maker," this documentary will forever change the way you see animal products). She also recommends coming face-to-face with actual farm animals at a place like Farm Sanctuary. "Vegan or not, when you meet these animals face to face, it's easy to make the connection between the animals that we care for as pets and the innocent animals we have been treating so cruelly," Von D tells Bustle. Most of all, Von D says that she wishes more people understood that we all have an innate connection to animals and to the planet, but that most of us "lost that somewhere down the road as we grew up." Going vegan, she says, is about returning to that sense of solidarity with the earth and all living beings. "Everyone is born a vegan. Everyone is born a true animal lover. It's only when we are taught to love certain animals and eat others that we disconnect from our true nature." Von D appears to have returned to her own true nature — and it looks a lot like beauty. Editor's Note: This article has been amended to reflect that not all Kat Von D Beauty products are fully vegan — yet. You can see a list of which of her beauty products are already vegan here.